Vote & Vax works with healthcare providers to offer convenient flu shots near polling places across the country. Find a Vote & Vax Clinic Near You. 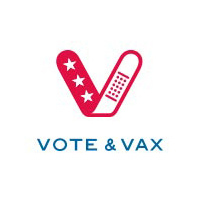 Download a free resource guide that explains how to participate in the Vote & Vax program. Vote & Vax has built a network of providers across the United States who organize and run flu clinics at polling sites on or around Election Day. For many providers, such as Marshall County Health Department in Marysville, Kansas, participating in Vote & Vax 2008 was a chance to continue the success they had in 2004 and integrate the program into their regular public health practice. We work with a broad range of flu shot providers. For example, students and faculty from the University of Maryland School of Pharmacy--many of whom had participated in 2008--delivered more than 200 flu shots at two community centers in 2012. Why not join us and become part of an amazingly successful group of organizations dedicated to protecting their communities from the flu!